The very successful event of series called Janoschka Innovation Day will continue in September and set its first footprint in South East Asia. Having dedicated former workshops to the tobacco, security and decorative market, the first oversees conference will be tailored to FMCG brand owners. Brand consistency, and especially in terms of printed packaging and market perception at the POS, has always been one among the key issues for brand owners. The upcoming Janoschka Innovation Day featuring “brand consistency and the importance of colour” will stage exactly this topic and offers a think tank about the quality of printed packaging. Experts from Europe and around the world will give insights about print color management and its implementation throughout the graphic supply chain, highlighting the do’s and don’ts from design to print. Download the preliminary agenda here. 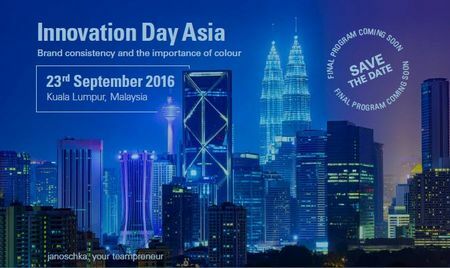 The Innovation Day will take place at the Janoschka subsidiary Asia Pacific Engravers in Kuala Lumpur on September 23rd. Ask for your personal invite via cynthia.tan(at)janoschka.com or feel free to register directly at www.janoschka.com/innovation-day-asia.